The annual Alaska Football Cup is the one football tournament that young players from all over the country look forward to every year. 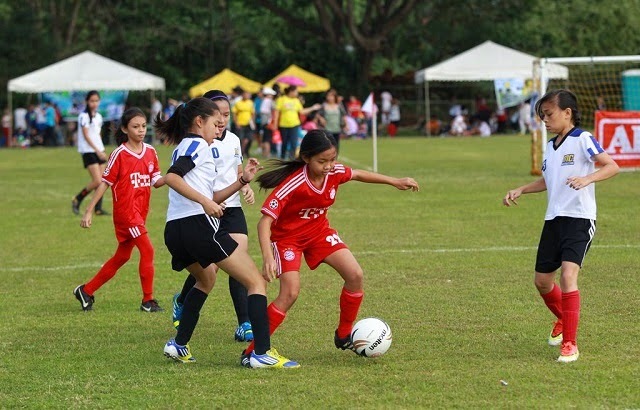 Teams representing schools and football clubs from all over the Philippines including Masbate, Baguio, Negros Occidental, Cebu, Davao, Palawan, Legaspi, Laguna, Batangas, Bukidnon, Zambales, Pampanga, Tarlac, Ilocos, Bicol, Romblon, Davao Sur, Compostela Valley, Quezon, Cavite, Albay, Pangasinan, Bacolod, Iloilo, Mindoro and Metro Manila will participate. The annual football event, which started in 1995, holds its 19th edition this year with over 300 teams of more than 4,500 players competing in the different categories. The two-day event will be played over more than 750 seven-a-side games, in 30 football fields, and officiated by over 120 game officials. The Alaska Football Cup is one of the country's most successful grassroots development program in football. Alaska believes that sports play an important role in instilling the value of determination, discipline, hard work, team work and sportsmanship among the youth. Sports help them achieve the “winning form” which is Alaska's goal for the children. The National Nutrition Survey of the Food and Nutrition Research Institute (FNRI) revealed issues on health that are best addressed by adopting an active healthy lifestyle and by regular consumption of nutritious food such as milk. Programs such as the Football Cup reinforces Alaska Milk's thrust in promoting a healthy lifestyle not just by drinking milk but also by engaging regularly in physical activities such as football. Alaska seeks to engage all Filipinos, especially the youth, in sports. It is in line with Alaska Milk’s program and dream to be part of the lives of more children in the Philippines and encourage these young champions to embrace a healthy and active lifestyle through football. The tournament develops the athletic skills of participants to the fullest because they compete against athletes of the same age as well as physical and mental development. Alaska does not just sell milk products. It promotes community development and nation building by nurturing positive values of teamwork, cooperation and fair play through sports activities like the 2014 Alaska Football Cup. Alaska promotes a healthy lifestyle, especially among children, through regular sports activities and proper nutrition. Watch the best young football players from all over the Philippines this weekend as they compete in various categories. Admission is free. For more information on the Alaska Football Cup please visit the Website http://alaskapowercamp.com/football/2014/ or follow on twitter: @ALASKAsportshub.